MoMac Residents enjoy gathering together around food, especially when sharing family recipes. A few times each semester, residents are invited to submit a recipe and ingredient list to the Commons staff. The staff then purchases all of the ingredients for the recipe and the resident is able to cook or bake there recipe. Once all of the dishes are made, all community members gather together for a buffet-style meal in the RCD or FiR apartment. You won't want to miss out on this culinary adventure! In a pan heat 2 Tbsp. of olive oil. Add the chicken and saute until fully cooked. Add the juice of three lemons and the oregano. Allow to simmer for 3 minutes. Set aside. Roughly chop the red onion, cucumber, and tomatoes. Add the remaining olive oil and apple cider vinegar to the red onion, cucumber, and tomatoes. In a separate bowl mix together the feta cheese, sour cream, and minced garlic. Assemble the Suevloki by adding some of the the chicken and vegetable mixture in a pita pocket. Top with the feta cheese sauce. Slice the Italian bread in half making a top half and bottom half. Layer the meats and cheese equally across the bottom half of the loaf of bread. Add the olive salad to the top of the layer of meat and cheese. Replace the top half of the loaf of bread. Cut into wedges and serve immediately. Twist on a classic Asian soup. Heat the oil in a 4-quart saucepan set over medium. When shimmering, add the onion and cook until soft, about four minutes. Add the tomatoes and salt, stir well, and then cover the saucepan and cook until the tomato tomatoes have broken down, about five minutes. Stir occasionally, and turn down the heat to prevent the tomatoes from sticking.Remove the cover and add the fish sauce. Pour in the water, raise heat to high, and bring to a boil. Reduce heat to a simmer and cook uncovered for 15 minutes. While soup is simmering skim off any scum that rises to the surface with a spoon.Turn off the heat, and then pour the lightly beaten eggs into to saucepan in a wide circle. Then stir gently with a wooden spoon to break the egg up into chiffon-like pieces. Ladle the soup into bowls. A delicious twist on a Southern dessert. Preheat the oven to 375 degrees F. Cover bottom of pie crust with pecans. In a medium bowl, whisk together the eggs and melted butter. Add the corn syrup, sugar, and the chopped chocolate. Stir until all ingredients are combined. 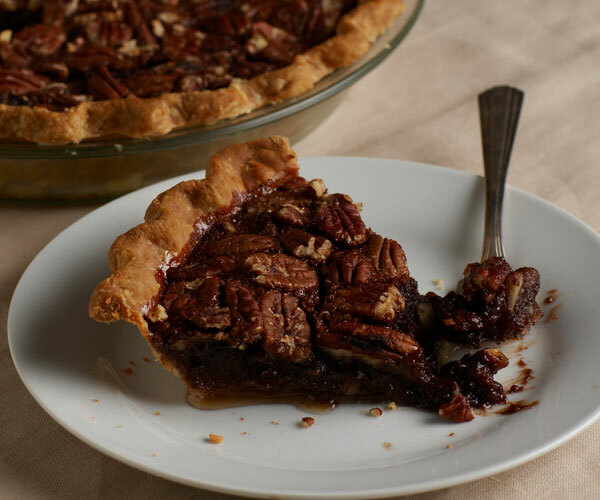 Pour mixture into the pie shell over the pecans and place on a heavy-duty cookie sheet. Bake for 10 minutes. Lower the oven temperature to 350 degrees F and continue to bake for an additional 25 minutes or until pie is set. Remove from oven and cool on a wire rack. Mediterranean inspired warm pasta dish. In a steamer set over boiling water steam asparagus, covered, until crisp-tender, about 3 minutes. Transfer asparagus to a colander and rinse under cold water to stop cooking. Drain asparagus well. In a 6-quart kettle bring 5 quarts salted water to a boil for pasta. In a deep 12-inch skillet heat butter and cream over moderately low heat until butter is melted and stir in zest, lemon juice, and salt. Remove skillet from heat and keep sauce warm, covered. Add pasta to boiling water and boil, stirring occasionally, until al dente. Ladle 1/4 cup pasta water into sauce and drain pasta in colander. Immediately add pasta and asparagus to sauce and cook over moderate heat, tossing, 1 minute, or until heated through. Add parsley and salt and pepper to taste and toss well. Sprinkle pasta with a little Parmesan and serve more Parmesan on the side.